As my blogging nickname, The Prof, suggests, I am a theatre professor. I teach theatre history, play analysis, directing and dramatic literature at a small liberal arts university (University of North Carolina at Asheville). So every semester I wrestle with how best to educate young, creative people in a way that will be most useful for their future. I don't mean "useful" to be understood only as "useful in their career," but rather "useful in their lives as human beings, citizens, and family members." And I also think about how they can be "useful" to their communities -- how can they contribute to the enrichment of their chosen place. Suggesting change in academia sometimes seems pointless. The old joke seems all too true: "How many professors does it take to change a light bulb?" "CHANGE????!!!!!!" As a result, I look to the quotation from Buckminster Fuller in the right side column of this blog: "You never change things by fighting the existing reality. To change something, build a new model that makes the existing model obsolete." And so I am not going to point to the absurdities of our current educational approach, except to say that its main focus seems to be on training employees, rather than educating artists. I'm interested in educating artists. And for me, the word "artist" has more to do with an attitude toward life, rather than how you make your living. An artist brings creativity, critical thinking, and a caring heart to whatever they do. How do you educate for that? Technical skills are, of course, important -- whether you are an actor or a blacksmith, you need to understand how to effectively use the tools of your trade. But I think we give too much weight to skill acquisition, and ignore the values and attitudes that are equally empowering. 1. Philosophy. Several semesters exploring the "why" of theatre, theatre's purpose. One semester should look at how artists of the past defined their "why," and another should help students develop their own beliefs. 2. Entrepreneurial skills. Part of this is very practical: introduce students to grantwriting, fundraising, market analysis, business model development, marketing. But also spend time helping them to think like entrepreneurs -- looking for ways to implement "creative destruction," ways to "disrupt" the current system, ways to control the means of production themselves rather than rely on others to hire them. Don't follow, lead. 3. Facilitation skills. I believe that artists should not only create their own work, but they should also possess the ability (and the willingness) to facilitate the creativity of others. They should learn the skills of helping people tell their own stories, sing their own songs, explore their own histories, paint their own pictures. 4. Community organizational skills. Artists should learn how to fully integrate themselves into the communities where they live. They should develop an understanding of how to work together with the community government, local organizations, clubs, charities, and other groups so that their work is deeply embedded in the community, drawing its artistic life from place. It wouldn't take many theatre departments devoted to this approach to theatre education to start changing the artistic ecosystem. Once young people who are interested in the arts but who have a (reasonable) concern about making a living see that there is an alternate path that would allow them to live a creative life, one that they are in control of (as much as one is ever in control of one's own life), and one that has a certain amount of security and stability, then I think we might quickly reach a tipping point. Not necessarily with those students who now are headed for conservatories or getting BFA's, but rather those who love creating theatre but aren't thrilled by the traditional path. Educated generalists empowered to change the world. I am looking for an opportunity to create such a curriculum, as it would develop the kind of artists who could lead a CRADLE organization in a small town. But artists trained this way could change the theatre scene everywhere. I was only able to stay for the morning sessions of TEDxMichiganAvenue, because my son was graduating from Illinois State that evening. But I've followed the Twitter hashtag, and read some of the blog posts about the speakers that came after me. And from what I can tell, many of the speakers seemed to touch on a similar topic: participation. 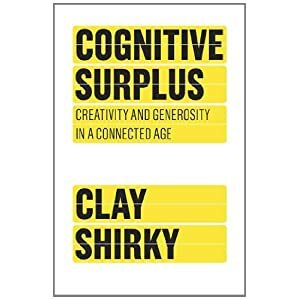 All of us seem to have soaked in the whole crowdsourcing, Clay Shirky here-comes-everyone-cognitive-surplus theme that currently dominates many discussions of how the web is changing our expectations about, well, just about everything. I have to admit, I'm sold -- I think there is a major change happening, and I think that Shirky is the one who tells the story in a way that is most relevant to the arts. But I'm curious as to whether people in the arts are really getting it. We keep talking about using the web for marketing, using Twitter and Facebook and various apps to "strengthen the relationship with the audience," or using Twitter for a back channel conversation during a show. And all of those things are important, and could lead to some interesting experiments, but I don't think they get to the center of this revolution -- or "reformation," as Ben Cameron said in his TEDx talk about a year ago. He said that the central questions being asked were "who's entitled to practice? How are they entitled to practice? And indeed, do we need anyone to intermediate for us in order to have an experience with a spiritual divine?" There's the real crux of the matter. There will always be spectators and performers. The question is whether the performers (and the playwrights as well) are going to continue to be separate groups. Will most artistic experiences continue to consist of an art-commodity created by artist-specialists and sold to consumers? That certainly is not the model being discussed by Shirky. Whether "lol cats" or YouTube videos or independent films created with equipment purchased with a credit card, people want to not only consume, but create as well. And the question is: will artists learn to share the stage with them, will they sit down and let amateurs stand up, will they work alongside them to create and tell stories? In all of this discussion about "strengthening the arts" in America, I don't hear anyone asking the question "for whom?" And the reason I don't hear it, I have a feeling, is that we are all holding on real hard to strengthening the arts for the artists -- it doesn't even occur to us that the category artist-specialist may end up shrinking to make room for an enlarged artist-amateur category, as the people-formerly-known-as-the-audience demand to participate, not just observe. Are we ready to share? Not only to share, but to facilitate and encourage?